Austrian physician and hydropathist; born at Josefstadt, Bohemia, March 1, 1835; educated at Vienna and at Prague (M. D. 1857), where he settled and became an assistant at the institute for the insane. In 1858 he entered the Austrian navy, but resigned his position as surgeon in 1861 and established a practise in Vienna. There he became interested in hydropathy, and was soon regarded as one of the leading authorities. Admitted to the medical faculty of the University of Vienna as privat-docent for hydropathy in 1865, he was one of the founders of the General Vienna Dispensary, where he is now (1905) departmental chief. In the same year he opened a private hospital near Vienna. In 1874 he became privat-docent in medicine, and was appointed assistant professor seven years later, becoming a full professor in 1899. Winternitz is a collaborator for hydropathy on Von Ziemssen's "Handbuch der Allgemeinen Therapie" (ed. 1881), Eulenburg's "Realencyclopädie der Gesammten Heilkunde" (ed. 1897), and Eulenburg's "Lehrbuch der Allgemeinen Therapie und der Therapeutischen Methodik" (Berlin, 1898-99). In 1890 he founded the "Blätter für Klinische Hydrotherapie," of which he is still the editor. 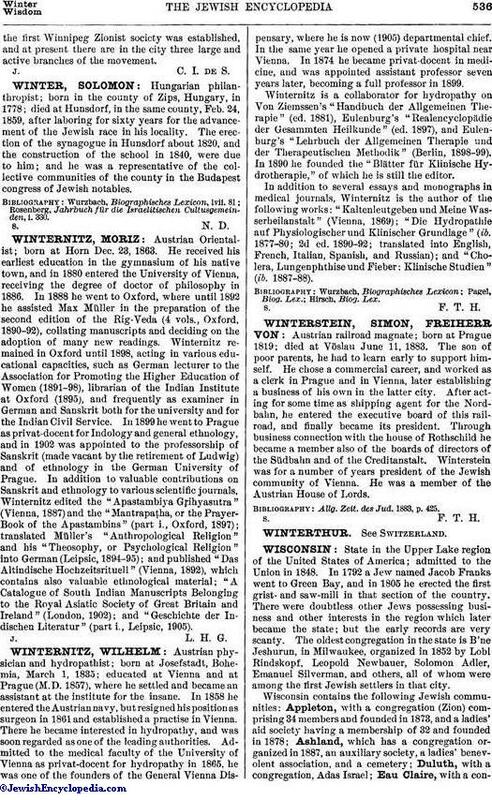 In addition to several essays and monographs in medical journals, Winternitz is the author of the following works: "Kaltenleutgeben und Meine Wasserheilanstalt" (Vienna, 1869); "Die Hydropathie auf Physiologischer und Klinischer Grundlage" (ib. 1877-80; 2d ed. 1890-92; translated into English, French, Italian, Spanish, and Russian); and "Cholera, Lungenphthise und Fieber: Klinische Studien" (ib. 1887-88).